The Euro started to fall yesterday morning after German Industrial Production decreased in January by 0.8% versus an expected 0.4% advance, while the trade surplus for the same month shrank to €18.5B, denting demand for the shared currency. However, during the North American session, despite better than expected US data, the British Pound surged following a possible Brexit “deal” that sparked optimism among investors, weighing on the Dollar and pulling up the Euro with it. Today, traders will turn their focus to the US CPI and Core CPI figures for possible short-term trading opportunities. 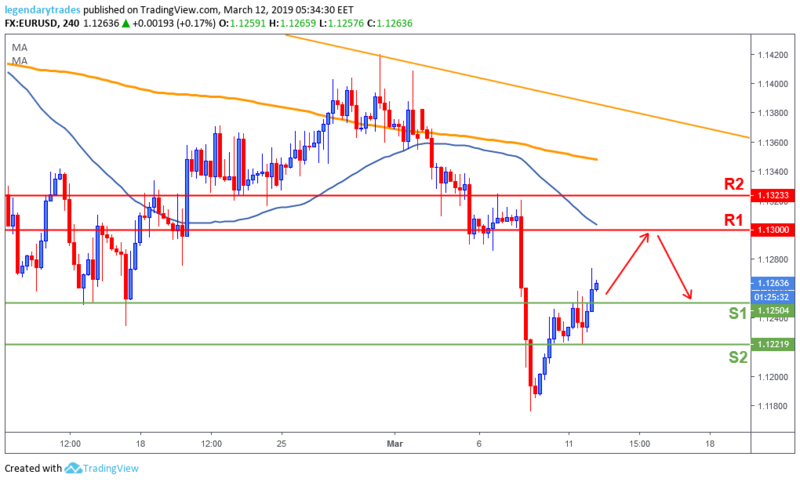 The Euro bulls continue their upward momentum by breaking above 1.1250 indicating a possible retest of the 1.13 (R1) resistance level and the 50-day moving average (blue line). Breaking above that level will be major key as it will wipe-off all the losses since last Thursday, signaling a possible short-term bullish reversal.